Switzerland need a point against the already-eliminated Costa Rica in order to progress to the knockout stage. Xerdan Shaqiri stole the show bagging the last-gasp winner against Serbia. Los Ticos were tough to break down against both Serbia and Brazil, but ended up losing both of these affairs. Xerdan Shaqiri scored the most important goal of the tournament so far after breaking clear over halfway and slotting under Serbia’s keeper Vladimir Stojkovic to give La Nati a precious 2-1 victory over direct rivals in the battle for the second-place finish in the Group E.
Switzerland now need a point on the final day against the already-eliminated Costa Rica to book a spot in the last 16 round, while a comprehensive victory could also see them top the group. Vladimir Petkovic indeed has reasons to be proud of his troops who showed a fantastic mental strength to come back from conceding a fifth-minute opener from Newcastle’s (spent the last season on loan at Fulham) Aleksandar Mitrovic. It was the first win-from-behind for any team in this tournament, and it came in such an important affair for both Switzerland and Serbia. First it was Arsenal’s Granit Xhaka whose superb effort from 25-yard line ended in the top right corner of Stojkovic’s goal to bring La Nati on level terms just after the restart. Xerdan Shaqiri barely influenced the game at all in the first 45 minutes, but he brought a complete new dimension into Swiss game later on proving out to be the difference-maker and deservedly the man of the match. Stoke midfielder showed it all, strength, pace and cool finish when he bagged the match-winner at the death of the clash with Serbia. They are now to take on the already-relegated Costa Rica who proved out to be a tough nut to crack for both Serbia and Brazil so far in the tournament. The Los Ticos held one of the main contenders for the crown to a goalless draw all up until the stoppage time when Barcelona’s Philippe Coutinho broke the deadlock before Neymar sealed the deal doubling the lead for Selecao. Vladimir Petkovic made no changes at all to the squad that held Brazil to a 1-1 draw. He does not have injured players, meaning we are likely to see a side similar to the one that defeated Serbia 2-1 on Friday. Breel Embolo may get the chance to lead the line instead of Haris Seferovic who did little to hurt Serbia. 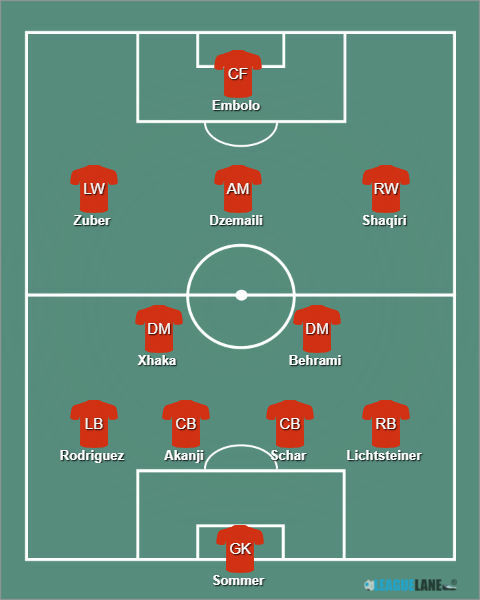 Sommer – Lichtsteiner, Schar, Akanji, Rodriguez – Behrami, Xhaka – Shaqiri, Dzemaili, Zuber – Embolo. Costa Rica faced Brazil with the same squad that lost 1-0 to Serbia on the opening day. Oscar Ramirez does not have significant injury woes ahead of the last round’s clash with Switzerland, meaning we should expect the same XI to start here. 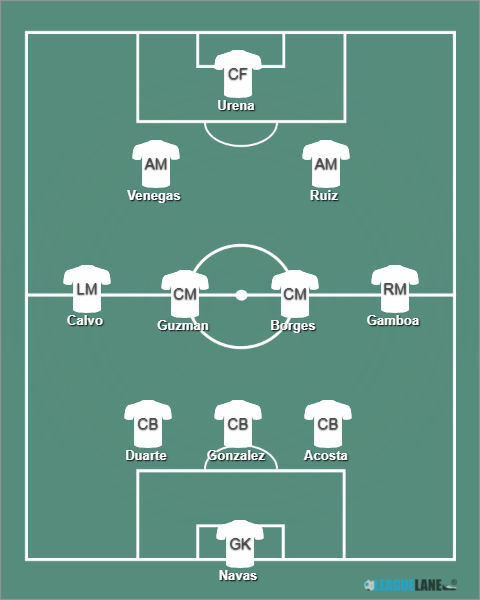 Navas – Acosta, Gonzalez, Duarte – Gamboa, Borges, Guzman, Oviedo – Venegas, Ruiz – Urena. The two outfits are about to lock horns for the third time in the history. Team snatched a win apiece in past two clashes. La Nati came on top when they met Costa Rica in a friendly in 2006 (2-0), while Los Ticos got the “revenge” four years later, beating Switzerland 1-0 in June. 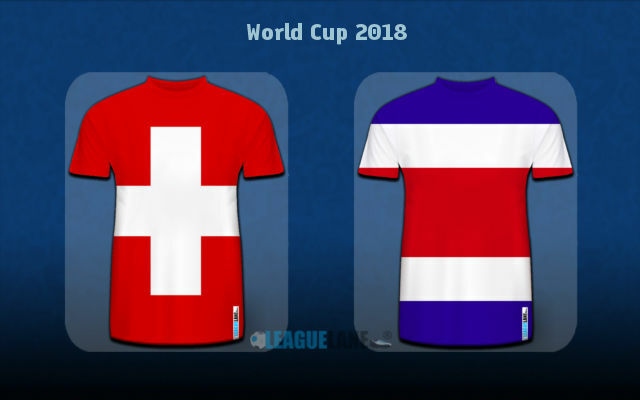 This clash certainly has prospects to continue the low-scoring trend in H2H history between Switzerland and Costa Rica. Even though Los Ticos have no chances of progressing after losing to both Serbia and Brazil, they will give their best to at least try and win a point in the tournament. Scoring a goal will be a huge challenge for the CONCACAF zone side given they are up against the rock-solid defensive line of Switzerland which allowed only a goal to Brazil and Serbia each after conceding just one in six games prior to the World Cup. Vladimir Petkovic’s troops have no reason to hurry here having already done most of the job by clinching four points in two opening ties. Switzerland to keep a clean sheet is our top betting recommendation here, a pick set at the 2.00 odds. It should be a very close affair with a single goal likely to make the difference for the European outfit. Predicted Full-Time Result is a narrow clean sheet victory for Switzerland. Switzerland to keep a clean sheet @ 2.00. Switzerland to win @ 1.82. Correct FT Score: 1-0 Switzerland @ 6.10.